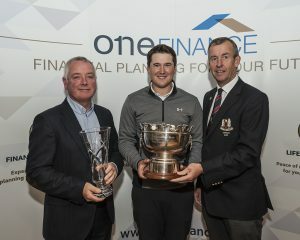 The 25-year-old shot two rounds of 68 for an eight under par total of 136 to win his home tournament by six shots from Co Louth’s Gerard Dunne, who stormed through the field after an opening 79 to take second place on two under thanks to a course record nine under par 63 in the second round. In the morning, Rafferty had covered the opening nine in one-under par after an eagle three at the par five sixth and a bogey at the par four eighth and he then birdied the 10th, 14th and 18th on the way in to take lead after the opening round on four under. That left him two shots ahead of Max Kennedy, Tom McKibben and Evan Farrell who all shot two under par 70s while Eanna Griffin was a shot further back on 71. However, none of the chasers managed to mount an attack on Rafferty in the afternoon with Kennedy shooting 81, McKibben 83 and Farrell 80 to drop out of contention while Griffin managed a level par 72 to finish on one under. During the second round Rafferty moved to five under with a birdie at the par four second but then bogeyed the par three fifth. However, back to back birdies at the sixth and seventh saw him turn in six under for the tournament and he got to nine under with three to go after birdies at 10, 14 and 15. He then missed the par four 18th green with his approach but found enough energy to get up and down for par and finish on eight under and six clear of Dunne. “I started this year by winning the Laytown & Bettystown Scratch Cup, I’ve won the South of Ireland Championship and now I have won this so it’s nice to have won those trophies and the Inter-Varsities Cup as well. It has been a good year even though I missed a couple of cuts at the wrong time of the year but I didn’t get down on myself. I am maturing and accepting what will be, will be,” said Rafferty. It was also a massive 16 shots better than his first round total of 79 in the morning but it was during that round that the seeds were sown for his record score. “I was not swinging it well the last few weeks but I figured something out on the 16th this morning and when I was going down the first in my second round I said to Evan Farrell that I was going to birdie every second hole and shoot nine under. I’m glad I kept my word,” said Dunne who finished six shots behind Rafferty in second place on two under. Dunne’s 63 was made up of seven birdies and an eagle at the par five 10th when he holed a putt from off the green after a 3 wood approach shot. 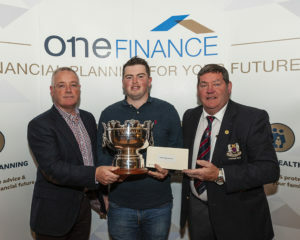 The presentation of the Dundalk Scratch Cup took place in the clubhouse where Caolan Rafferty was presented with the trophy by sponsor Martin McDonnell of One Finance and Dundalk Captain Gerry Byrne. DUNDALK SCRATCH CUP sponsored by One Finance: 136 – Caolan Rafferty (Dundalk) 68, 68. 142 – Gerard Dunne (Co Louth) 79, 63. 143 – Joshua Robinson (Lisburn) 72, 71; Eanna Griffin (Waterford) 71, 72; 146 – Conor Curran (Dundalk) 75, 71; John McCarthy (The Island) 74, 72; Eugene Smith (Laytown & Bettystown) 75, 71; 147 – G McAuley (Dunmurry) 76, 71; Shane McGlynn (Portmarnock) 75, 72; Eoin Murphy (Dundalk) 74, 73; Aaron Marshall (Lisburn) 72, 75; Ronan McCrory (Lisburn) 79, 69. Second 18 Nett: Ronan Cowhey (2, Elm Park) 70. CSS: 73 (Round 1), 73 (Round 2). The 30-year-old Irish international shot a five under par 67 to pip Masserene’s Tiarnan McLarnon on countback after the two Ulster players were tied on 138, six under par, with the defending champion, Dundalk’s Caolan Rafferty, two shots further back in third. The three internationals had played together in the marquee group and were very much in contention after the opening round when Rafferty and McLarnon had shot two under par 70s and Campbell was a shot further back. Slieve Russell’s Seamus Cullen led after the round following his excellent four under par 68 which included five birdies and he led by one shot from Boys International Eoin Murphy of Dundalk who had also shot five birdies in compiling his three under par round of 69. 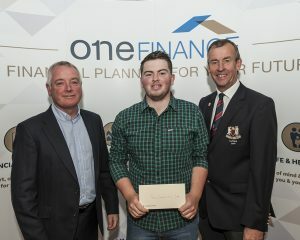 It was another Dundalk player, former winner and course record holder Aaron Grant, who set the early club house lead as he added a three under par 69 to his opening 73 for a two under par total of 142. He held the clubhouse lead momentarily as the top three were in the group behind and were producing fireworks of their own with McLarnon eagling the par five sixth to go to four under and a back to back birdies on the ninth and tenth plus a birdie three on the 14th got him to seven under while Campbell was on six under at that points after five birdies of his own. A bogey at 16th saw McLarnon drop back to six under while a birdie two at 17th got Campbell to six under and in the end it proved decisive as Campbell’s second round 67 was enough for him to pip McLarnon’s 68 on countback as they both tied on 138. 138 – Colin Campbell (Warrenpoint) 71, 67; Tiarnan McLarnon (Masserene) 70, 68 (Campbell wins on countback). 144 – Seamus Cullen (Slieve Russell) 68, 76; Ted Collins (Dun Laoghaire) 73, 71; Geoff Lenehan (Portmarnock) 71, 73; Darragh Coghlan (Portmarnock) 72, 72; Glenn McAuley (Dunmurry) 71, 73. 148 – Brendan Lawlor (Ardee) 75, 73; Jonathan Kelly (Athy) 72, 76. 154 – Conor Curran (Dundalk) 75,79; Maurice Murphy (Dundalk) 77, 77; Peter Rogers (Dundalk) 77,77; Jamal Sabir (Moate) 77, 77, Dara Smith (Castle) 77, 77. 155 – Sean Laverty (Dundalk) 74, 81; Shane Hession (Dundalk) 74, 81. 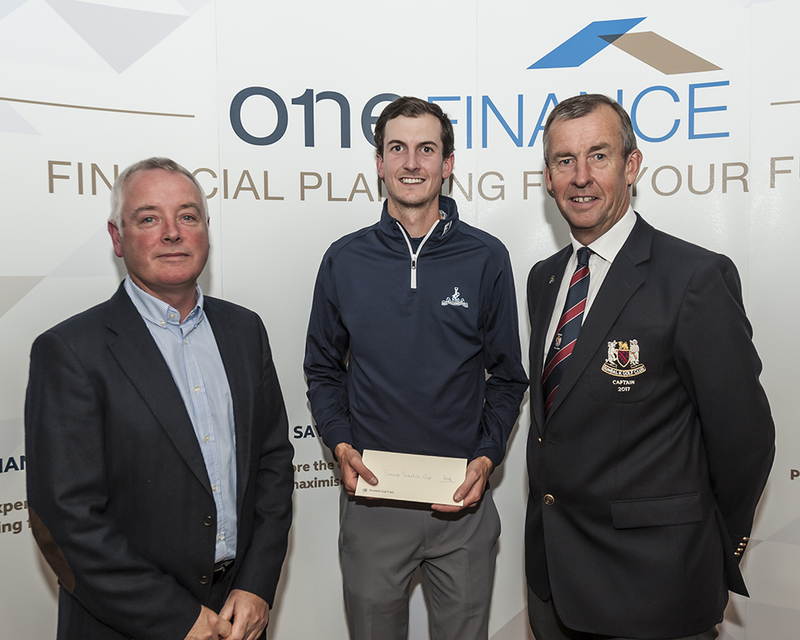 Sunday, September 17 – Dundalk Senior Scratch Cup sponsored by One Finance – 1st Colm Campbell Jr. (+3) (Warrenpoint) 138/67 (71/67). 2nd Tiernan McLarnon (+3) (Masserence) 138 (70/68). 3rd Caolan Rafferty (+4) (Dundalk) 140 (70/70). 4th Ryan McKinstry (+1) (Cairndhu) 141 (72/69). Best Nett: Brendan Lawlor (2) (Ardee) 144 (73/71). 1st 18 Gross: Seamus Cullen (0) (Slieve Russell) 68. 1st 18 Nett: Eoin Murphy (1) (Dundalk) 68. 2nd 18 Gross: Aaron Marshall (0) (Lisburn) 67. 2nd 18 Nett: Gerard Dunne (+2) (Co Louth) 69. 1st Round CSS 73, 2nd Round CSS 73. Seamus Cullen of Slieve Russell leads the Dundalk Scratch Cup sponsored by One Finance after shooting a four-under par 68 in the first round of the prestigious 36 hole event at Dundalk Golf Club. He leads by one shot from Dundalk teenager Eoin Murphy with defending champion Caolan Rafferty and fellow Irish international Tiarnan McLarnon another shot back. The other three players to break the par of 72 were Geoff Lenehan, Colin Campbell and Gareth McAuley who all shot 71. After bogeying the second, Cullen got under par with back to back birdies at the par three fifth and par five sixth and went to two under with a birdie on the par four 11th, Further birdies followed at the short par four 14th and the par four 18th as he signed for a 68. Seventeen-year-old Murphy, who is a current Irish Boys International, opened with a birdie three at the first but handed it back at the second. He birdied the fifth to turn in one under and went to two under with a birdie four at the par five 10th. He also birdied the par five 12th and although he bogeyed the par three 13th he finished with a birdie three at the 18th for his round of 69. 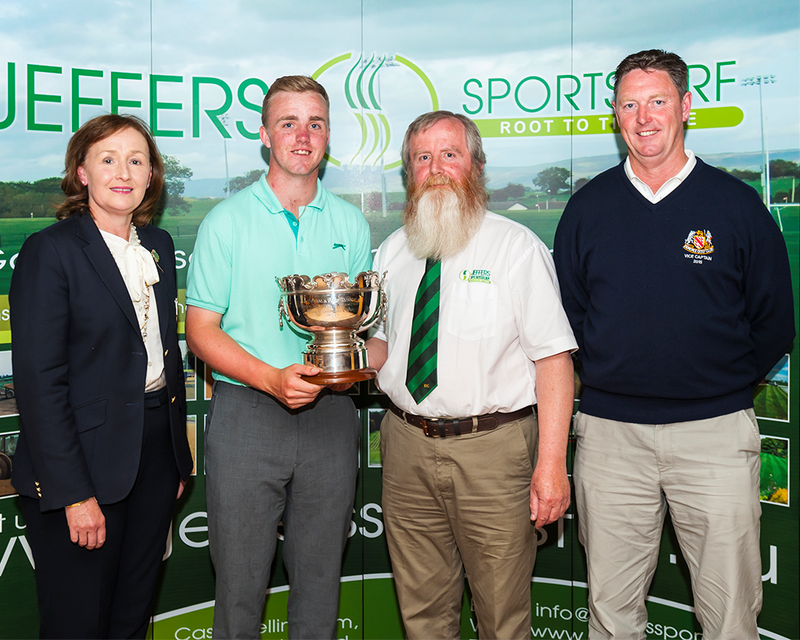 Teenager Thomas Mulligan will aim to become only the third player to retain the Dundalk Scratch Cup, sponsored by Jeffers Sports Turf, when the 36-hole tournament takes place over the famed Blackrock links this Sunday. 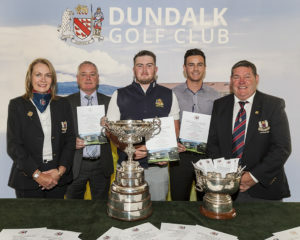 Mulligan became the youngest ever winner of this prestigious competition last year when, as a 15-year-old, he won by three shots from his Co Louth clubmate Gerard Dunne and Dundalk’s Caolan Rafferty with the highlight being his impressive seven-under par 65 in the first round. If he manages to come out on top again this year Mulligan will join the legendary Joe Carr and Declan Brannigan as the only players to win the Dundalk title back to back with Carr achieving the feat in 1965 and 1966 while Brannigan did it in 1972 and 1973. He’ll face a strong challenge from Warrenpoint’s Colm Campbell who has started the season in superb form. He reached the semi-finals of the West of Ireland Championship at Easter before winning the Grange Scratch Foursomes with Ryan Gribben last week and then capturing the Lee Valley Senior Scratch Cup on Sunday. 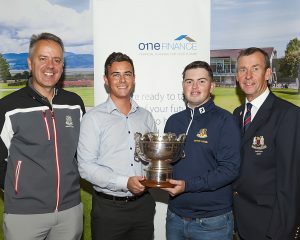 Others to watch out for include Colm Fairweather (Knock), Derek Downie (Sutton) and James Fox who won the title in 2009. 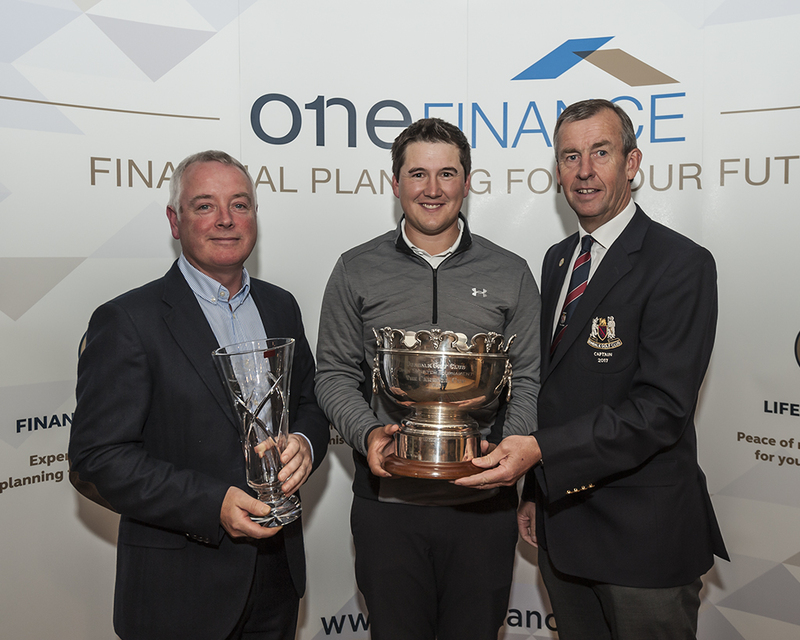 The field also includes two of the winners from last week’s Faldo Series Ireland Championship at Lough Erne Resort as Hollywood’s Rory Williamson, who won the U21 title, and Dundalk’s Eoin Murphy, who won the U16 event, set to tee it up on Sunday. Murphy is part of a strong Dundalk contingent that includes another former winner, Aaron Grant, and Rafferty. Grant and Rafferty recently reached the quarter-finals of the West of Ireland at Rosses Point. The Dundalk course, which hosted last year’s Irish PGA Championship, has undergone major redevelopment work over the past number of years with the most recent work being the addition of new strategically-placed fairway bunkers on several holes. Previous winners of the Dundalk Scratch Cup include three times major champion Padraig Harrington and all are welcome to the 2015 event where there is every likelihood they will see one of golfing stars of the future in action.